Surprise! Operations and IT aren't getting along when it comes to IoT. Research shows that IT and OT personnel are not well aligned on IoT initiatives, and they need to cross that divide for those enterprise IoT projects to prove viable. 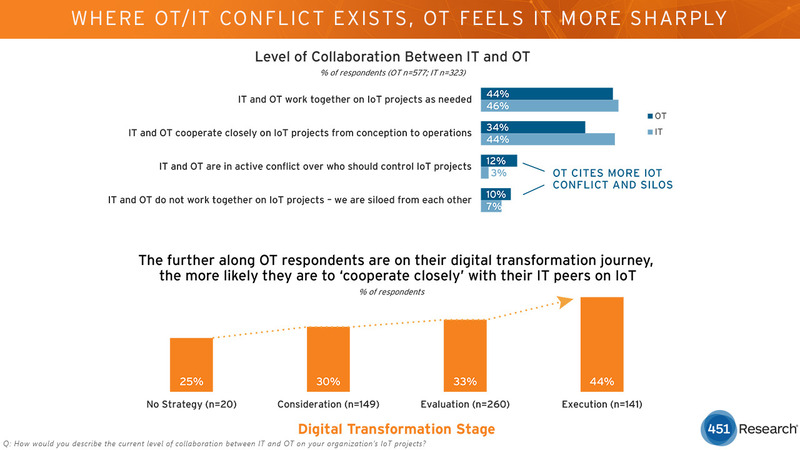 Only one-third of OT respondents (34%) said they ‘cooperate closely with IT’ on IoT projects from conception to operations. A relatively small group of respondents said they were in ‘active conflict’ with IT over IoT, OT professionals are four times more likely to characterize their relationship with IT that way. More than half (55%) of the OT survey respondents currently deploy IoT within their organization, and 44% have successfully moved those projects from proof of concept to full-scale deployment. New operational efficiencies and data-analytics capabilities are driving successful projects; however, many IoT projects face roadblocks in the trial stage due to the IT and OT divide and budget, staff, and ROI concerns. Additional details in the graphic below. Want the full findings? 451 Research will happily sell it to you. For the last 3 years we have been tracking the trends of the IoT developer community through the IoT Developer Survey  . Today, we released the third edition of the IoT Developer Survey 2017. As in previous years, the report provides some interesting insights into what IoT developers are thinking and using to build IoT solutions. Below are some of the key trends we identified in the results. The survey is the results of a collaboration between the Eclipse IoT Working Group, IEEE, Agile-IoT EU and the IoT Council. Each partner promoted the survey to their respective communities. A total of 713 individuals participated in the survey. The complete report is available for everyone and we also make available the detailed data [xls, odf]. As with any survey of this type, I always caution people to see these results as one data point that should be compared to other industry reports. All of these surveys have inherent biases so identifying trends that span surveys is important. The 2017 survey participants appear to be involved in a more diverse set of industries. IoT Platform and Home Automation industries continue to lead but industries such as Industrial Automation, Smart Cities, Energy Management experience significant growth between 2016 to 2017. 2. Security is the key concern but…. Security continues to be the main concern IoT developers with 46.7% respondents indicating it was a concern. Interoperability (24.4%) and Connectivity (21.4%) are the next most popular concerns mentioned. It would appear that Interoperability is on a downward trend for 2015 (30.7%) and 2016 (29.4%) potentially indicating the work on standards and IoT middleware are lessening this concern. This year we asked what security-related technologies were being used for IoT solutions. The top two security technologies selected were the existing software technologies, ie. Communication Security (TLS, DTLS) (48.3%) and Data Encryption (43.2%). Hardware oriented security solutions were less popular, ex. Trusted Platform Modules (10%) and Hardware Security Modules (10.6%). Even Over the Air Update was only being used by 18.5% of the respondents. Security may be a key concern but it certainly seems like the adoption of security technology is lagging. Overall, it is clear IoT solution development requires a diverse set of language programming skills. The specific language of choice really depends on the target destination. Linux continues to be the main operating system for IoT. This year we asked to identify OS by the categories: Constrained Device and IoT Gateway. On Constrained Devices, Linux (44.1%) is the most popular OS but the second most popular is No OS/ Bar Metal (27.6%). On IoT Gateway, Linux (66.9%) becomes even more popular and Windows (20.5%) becomes the second choice. The survey also asked which Linux distro is being used. Raspbian (45.5%) and Ubuntu (44.%) are the two top distros for IoT. If Linux is the dominant operating system for IoT, how are the alternative IoT operating systems doing? In 2017, Windows definitely experienced a big jump from previous years. It also seems like FreeRTOS and Contiki are experiencing growth in their usage. Amazon (42.7%) continues to be the leading IoT Cloud Platform followed by MS Azure (26.7%) and Google Cloud Platform (20.4%). A significant change this year has been the drop of Private / On-premise cloud usage, from 34.9% in 2016 to 18.4% in 2017. This might be an indication that IoT Cloud Platforms are now more mature and developers are ready to embrace them. For the last 3 years we have asked what connectivity protocols developers use for IoT solutions. The main response has been TCP/IP and Wi-Fi. However, there are a number of connectivity standards and technologies that are being developed for IoT so it has been interesting to track their adoption within the IoT developer community. Based on the 2017 data, it would appear Bluetooth/Bluetooth Smart (48.2%), LPWAN technologies (ex LoRa, Sigfox, LTE-M) (22.4%) and 6LoWPAN (21.4%) are being adopted by the IoT developer community. However, it would appear Thread (6.4%) is still having limited success with developer adoption. Overall, the survey results are showing some common patterns for IoT developers. The report also looks at common IoT hardware architecture, IDE usage, perceptions of IoT Consortiums, adoption of IoT standards, open source participation in IoT and lots more. I hope the report provides useful information source to the wider IoT industry. Next week we will be doing a webinar to go through the details of the results. Please join us on April 26 at 10:30amET/16:30pmCET. Thank you to everyone who participated in the survey, the individual input is what makes these surveys useful. Also, thank you to our co-sponsors Eclipse IoT Working Group, IEEE, Agile IoT and the IoT Council. It is great to be able to collaborate with other successful IoT communities. We will plan to do another survey next year. Feel free to leave any comments or thoughts on how we can improve it. Guest post by Evan Birkhead. The Bayshore IT/OT Gateway is used by industrial enterprises to provide IT with visibility into big OT data and to provide OT with access to applications such as advanced IT analytics. Transformation of OT data (Modbus TCP, DNP3, Ethernet/IP, and so on), into formats that can be interpreted by IT analytics programs (JSON, https, http, etc.) will be crucial to this adoption. Guest blog by Ian Skerrett. It originally appeared here. Today we release the results of our second annual IoT Developer Survey. Like last year it provides an interesting insight into how developers are building IoT solutions. This year the Eclipse IoT Working Group partnered with IEEE IoT and the AGILE-IoT research project to expand the scope and respondent pool for the survey. Thanks to this partnership, we had 528 participants in the survey, up from 392 last year. The partnership also allowed us to analyze the data to look for any significant difference between the different IoT communities. As with any surveys of this nature, I encourage readers to see these results as one data point that should be compared with other data and industry trends. These results will have certain biases but I do believe these results identify some interesting trends in the IoT industry. Companies are shipping IoT solutions today. 46% of the respondents claim their company develops and deploys an IoT solution today. Another 29% plan to do so in the next 6 months. This is a clear indication the industry is maturing quickly. Security continues to be a key concern. It’s not a big surprise that security continues to be the top concern in IoT. Interoperability is the second key concern. I do believe we are on the way to solving some of the interoperability issues with projects like Eclipse Hono, Eclipse Smarthome and Eclipse Kura. I also think some of the work the AGILE-IoT project is doing will address these issues. However, it still seems the IoT industry still needs to focus on security. It is a difficult issue that needs to be solved.For companies that have deployed a solution today, performance is rising to the third key concern. It is not clear what the performance issues are, but it is something that warrants more investigation. MQTT and HTTP are the dominant message protocols.Without a doubt MQTT has become a pervasive and widely used protocol for IoT. HTTP being the other protocol. The other messaging protocol supported in the Eclipse IoT community is CoAP. It did not receive as much support, but it does appear to have support in certain industries. For instance, the use of CoAP increases if the respondent is in the IoT Platforms or Smart Cities industry. The fact IoT Platforms are supporting CoAP is expected and a good thing. It does seem Smart Cities industry is using CoAP but I am not sure where or how. If anyone has details, please leave a comment.As an aside, the success of MQTT is a testament to IBM’s strategy to standardize MQTT at OASIS and start the Eclipse Paho project. It really is a perfect case study for using open source and open standards to gain broad industry adoption. For example, 1) MQTT is now supported by IBM Bluemix, Amazon AWS IoT, MS Azure IoT, plus every other IoT middleware platform in the market, 2) the new Arduino board is also using MQTT to communicate with their cloud, and 3) Eclipse Paho and Eclipse Mosquitto are some of the most popular and active projects at Eclipse. MQTT is everywhere. Well done IBM. Linux is the dominant IoT operating system. Over 70% of the respondents claimed they use Linux for their IoT operating system. The next more popular section at 23% was No OS/Bare metal. In the last number of years, a number of new IoT operating systems have been introduced (ex. ARM mbed, Contiki, RIOT, Zephyr) but the adoption still hasn’t materialized. It seems many companies are using Yocto to create their own Linux distro for their IoT solution. It will be interesting to watch how these other operating systems grow in comparison to Linux. Amazon leads in IoT cloud services. Not terribly surprising Amazon came out on top as the top cloud service provider. However, Private/On premise was a close second so I think this is an indication that IoT cloud services is still in its infancy. What did surprise me was that Microsoft Azure was number 3 in the survey and does even better when a company has a deployed solution. This seems to reflect MS Azure’s heavy emphasis on IoT use cases. Open source is pervasive in IoT. I strongly believe open source is critical to the success of the IoT industry. Therefore, I was encouraged to see 58% of the respondents are actively engaged with open source. I think it is a great statement on the work we have been doing at Eclipse IoT to create an open source community for the IoT industry. This is the second year we have done this type of survey so I was curious what has changed between 2015 and 2016. Interestingly enough, not a lot has changed. Many of the trends and highlights mentioned above are consistent with the 2015 results. This consistency would appear to confirm that the results are a good reflection of how developers are building IoT solutions. Thank you to everyone who participated in the survey. We definitely appreciate your input. The complete results are available on slideshareand the raw data in xls and ods format. Feel free to leave a comment or contact me if you have any questions. IoT practitioners are at the forefront of their company's digital initiatives. But is the rest of your company ready for its digital moment? The expectations are high in the C-Suite for digital transformations, but there's still more talk than action for many companies. New research by McKinsey Institute suggests only 17% of corporate boards are participating in strategy for big data or digital initiatives. The good news is almost half of big companies have managed to get their CEOs personally involved, up from 23 percent in 2012. The most common hurdle to meeting digital priorities, executives say, is insufficient talent or leadership. Across the C-Suite, 71% expect that over the next three years, digital trends and initiatives will result in greater top-line revenues for their business, and large shares expect their profitability will grow. More than half of executives say that, in response to digital, their companies have adapted products, services, and touchpoints to better address customer needs. Executives most often cite analytics and data science as the area where their organizations have the most pressing needs for digital talent, followed by mobile development and user experience. Executives who report ample organizational support for adopting risky digital initiatives are twice as likely to work for a high-performing company as executives reporting resistance to risky initiatives due to fear of failure. Forty-seven percent say cutting-edge digital work helps them attract and retain digital talent. Companies’ priorities vary across industries, reflecting key sources of value in each sector: big data is a top priority in healthcare, for example, while automation is a greater focus in manufacturing (see graphic below). The digital interconnection of billions of devices is today’s most dynamic business opportunity and at present, the Internet of Things remains a wide-open playing field for enterprises and digital strategy. According to the study, buy-in from the C-Suite and aligning with corporate culture and objectives is key to digital success.